Fall Fling - The Rosehill Bar and Lounge. Please see the attached agenda for the upcoming Parent Council meeting. The meeting will be held on October 17th at 7pm, in the Library. Minutes of the September AGM and Parent Council meeting cab be found here. the Graduation Excursion to Ottawa. Brown School's World Changers are gearing up for our We Scare Hunger campaign. We will be supporting the Daily Bread Food Bank by collecting non-perishable foods from October 17 - November 1st. Last year we were able to collect over 2500 pounds of food - we would love to surpass that for 2016! More and more people are relying on food banks and your donations make a huge difference. as well as other initiatives that spark the students' interest. If you have any questions don't hesitate to contact World Changers' parent co-chairs, Allison Fortier and Laura Finch. Congratulations to the Boys Football Team for their outstanding effort and achievement at their tournament on Tuesday. The team played with passion and determination and it resulted in a first place finish that day. The team is off to the Conference Finals for a rematch of last year's championship game vs. McMurrich Knights. Next team practice is on Thursday October 20th @ 7:15am at the park. Good luck to the Girls Football Team who are playing their all day tournament on Monday Oct 17th @ Forest Hill Memorial. The team has been preparing for several weeks now and is excited to get the season started. Our Speaker Series is back! 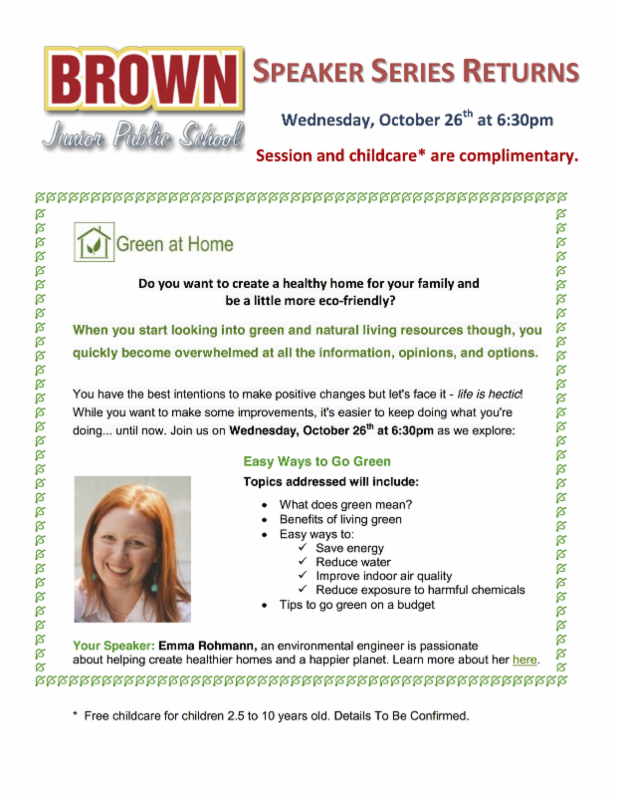 We begin with talking the easy way to get green, create a healthy home and be more eco-friendly. Join us on October 26th at 6:30pm.